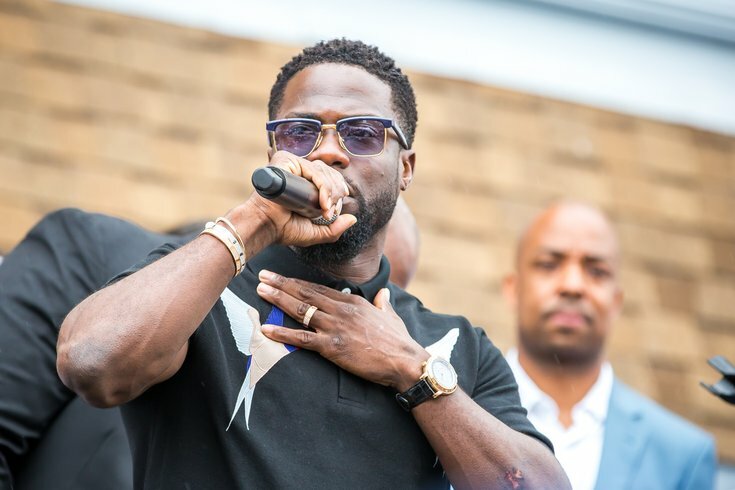 Did Kevin Hart name his soon-to-be child after a Philly neighborhood? Kevin Hart and his wife Eniko Parrish are pressing forward as a couple despite the allegations — and a seeming admission, on stage in Atlanta — that the North Philly native and star comedian engaged in one or more affairs over the summer. Drama aside, they're also naming their first child together Kenzo. They announced it together during a lavish baby shower held this past weekend at Malibu's Calamigos Beach Club. Coming from Hart, doesn't this name sound like it could be an odd reference to Kensington? A few people on Twitter sure thought so and had a laugh about it. On a lighter note: Kevin Hart is from Philly and is still naming his child Kenzo. Ok.
To be clear, if Kevin Hart named his kid Kenzo in a strange nod to Philadelphia, it would instantly be among his greatest jokes. The evidence overwhelmingly points to much more plausible explanations. Yes, Hart loves Philly. Philly loves Hart. But Hart isn't from Kensington. He grew up at 13th and Erie, well north and west of Kensington, and made no mention of the neighborhood when he stopped by his first Philly apartment back in February. Kensington is a place with pride, and lots of it. Kenzo is a kind of noun/adjective used to describe the seedier parts of the neighborhood. It's doubtful Hart would name his kid after some backhanded Philly slang. The only evidence of Hart having a link to the name Kenzo is from the 2013 BET Awards, when he donned a sweater designed by the French luxury brand of the same name. Who styles Kevin Hart? I see you in dat new Kenzo bew bew! That brand was founded by Japanese designer Kenzo Takada, whose Japanese descent points us to the most logical inspiration for the name. Kenzo, represented in Japanese as 健三, refers to health and wisdom. The name is typically given to a family's third child in Japanese culture. Kevin Hart and Eniko named their baby Kenzo. Japenese origin meaning wise and three. Hart has two children — Heaven, 12, and Hendrix, 9 — from his previous marriage with Torrei Hart. Makes sense. Earlier this year, Hart told People he would leave the responsibility of naming his next child to his wife under the condition that "Kevin" somehow be a part of the name. At least Eniko gave him the first two letters. Hart will return to the big screen Dec. 20 with the premiere of "Jumanji: Welcome to the Jungle."